Project obstacles and solutions: Citizens Energy Group made plans to build a new water treatment facility at its Morse Reservoir location. F.A. Wilhelm Construction was awarded the contract which includes a million gallon finished water holding tank, three horizontal pressure filters, and two induced draft aerators. The plant will have the capability of processing six million gallons of water per day. IMI supplied 4,500 psi, air-entrained concrete for the holding tanks. 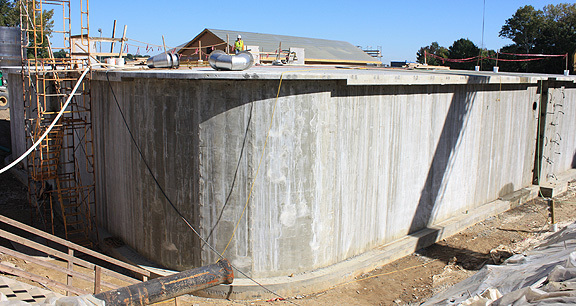 Three keys to the concrete used for these tanks were concrete maturity, shrinkage control and waterproofing. The floor and walls of the holding tank were designed with post-tensioned concrete. The tendons were stretched at 15-18 hours after the pour. Early strength was important to make this happen. IMI used a maturity curve with a maturity meter to test strength. The tendons are active reinforcement for the concrete to prevent cracking by reducing tensile stress on the concrete. Shrinkage control is another step to prevent cracks from occurring. IMI designed the mix with a .04 shrinkage limit. IMI QC/QA added a high range water reducer. This admixture was used to maintain a low water-to-cement ratio to reduce shrinkage, while producing a workable mix. As extraneous water evaporates from concrete, it begins to shrink, causing micro cracks. Adding the water reducer kept the concrete within its specifications for shrinkage. However, this achieved two other critical criteria for this project. First, it greatly increased the strength. The 4,500 psi mix was achieving up to 7,000 psi at 28 days. The other criteria was the density of the wall. The concrete used in this project needed to be water tight to prevent ingress of water in or out of the structure as well to preserve reinforcing steel. This concrete mix had a very low permeability due to the density and strength of the mix. In many cases, crystalline admixtures are used to waterproof concrete. These react with moisture in the concrete to produce crystalline formations throughout pores and capillaries to seal concrete. In this case, however, the use of a high range water reducer and the high strength of the concrete produced a non-porous concrete finished wall that water did not penetrate. IMI supplied a total of 2,400 yards of concrete for this project. For more information on using water reducing admixtures in your concrete, contact one of our sales representatives. Click here.